Robert Constant, network administrator for New College’s Office of Information Technology, has worked with the Campus Police department to improve their computer systems. 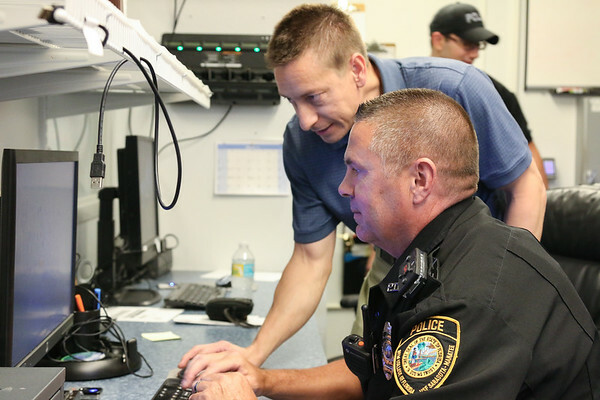 Robert Constant, network administrator for New College’s Office of Information Technology, was selected as the 2019 Florida Association of Public-Safety Communications Officials Information Technologist of the Year. The Public-Safety Communications Awards are presented annually by Florida APCO to public safety communications personnel who have demonstrated the highest levels of personal and professional conduct and performance in their line of work. Florida APCO is the state chapter of APCO International, the world’s oldest and largest organization of public safety communications professionals. New College Police Captain Kathleen Vacca nominated Constant, who was chosen from nominees across the state. He’ll be presented with the award at the Florida APCO 2019 Conference in Daytona Beach April 30. Vacca described Constant as someone who is always up to the challenge, whether it’s dealing with computer hardware, software applications, installation or maintenance. “His tenacity to get to the bottom of a multifaceted technology problem, coupled with his calm demeanor, are also greatly appreciated,” Vacca said. One of his biggest projects was installing computers in all of the department’s squad cars, an initiative Constant took the lead on when he joined New College in 2010. New College Professor Uzi Baram has won the 2018 Archaeological Conservancy Award.